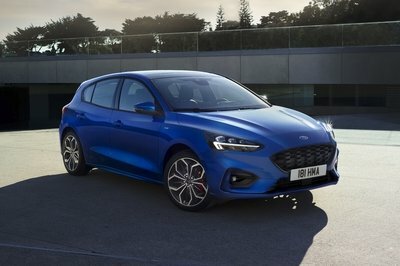 The 2019 Ford Focus ST is the performance-oriented version of the fourth-generation Focus, a hatchback unveiled in 2018. 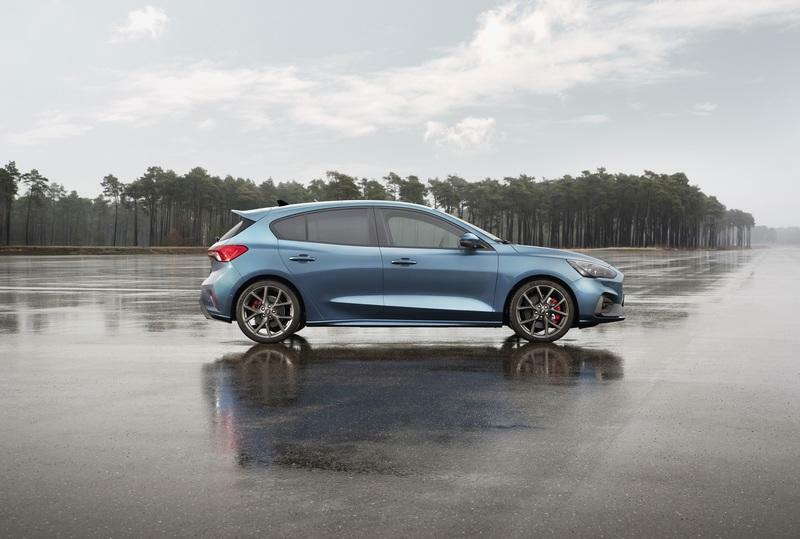 Introduced in February 2019, the new Focus ST brings many changes to the table, including a bigger EcoBoost engine, more power than ever, and state-of-the-art technology. Unlike its predecessors, the new Focus ST won’t come to the U.S., as Ford decided to stop offering most of its passenger cars in North America. The previous-gen Focus ST was already more powerful than its main competitor, the Volkswagen Golf GTI, and the new hatchback takes things up a notch. 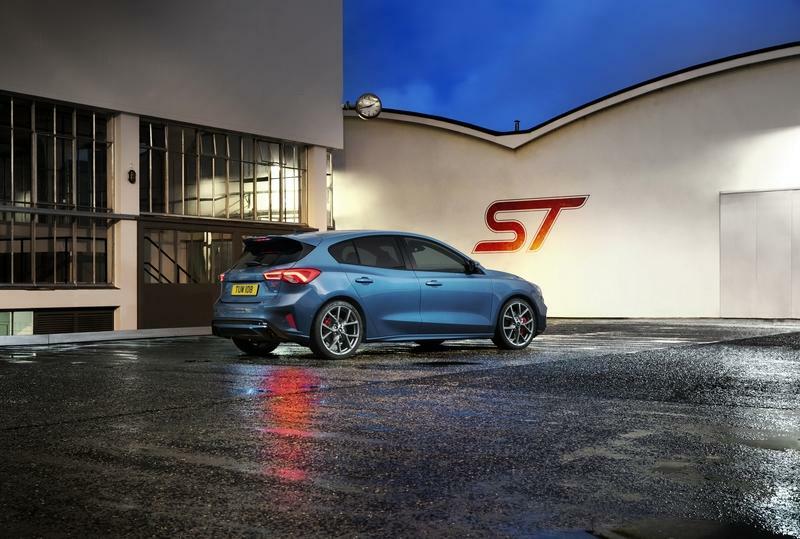 Rated at 276 horsepower, it’s also more powerful than the Hyundai i30 N with the Performance Package, which places the Focus ST at the top of its segment. Alongside the new 2.3-liter EcoBoost engine, Ford also unveiled a new EcoBlue mill for diesel enthusiasts that want an alternative to the Golf GTD. Let’s find out how the new Focus ST compares to its rivals in the review below. 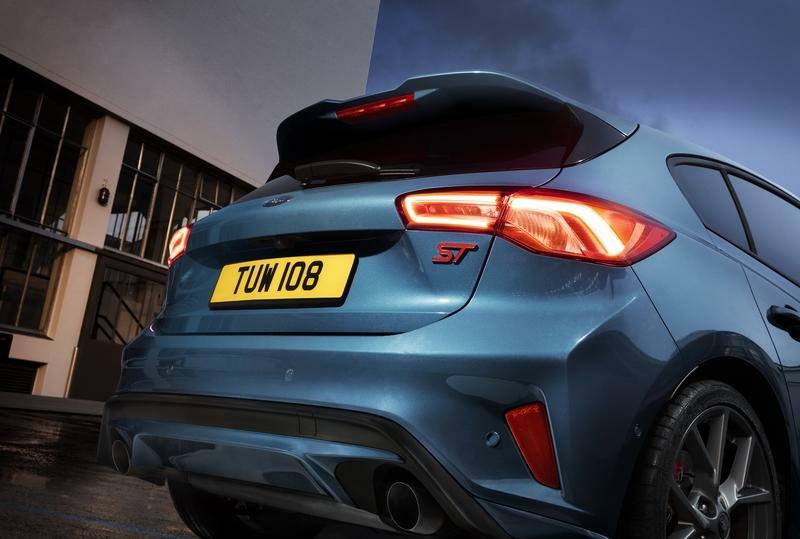 The new Focus ST is notably more aggressive than its predecessor. 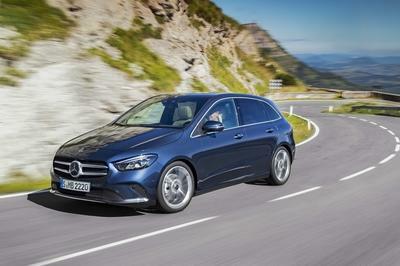 But not just because it’s based on a more modern and sportier version of the hatchback. Ford actually decided to make the ST more aggressive that the standard version by enlarging the front grille and by adding a bigger intake in the bumper. The new grille is a bit wider in the center and sports a new honeycomb-style mesh and the familiar red "ST" logo. The same mesh trickles into the bumper outlet below. While this opening isn’t notably bigger than the standard intake, the fact that it is flanked by black trim instead of body-colored panels makes it seem the bumper has a massive opening stretching from one corner to the other. That’s a cool effect that makes the ST look almost as aggressive as the Focus RS. The headlamps are also different compared to the regular model, mostly because it has new LED strips toward the edges that meet the engine hood and the fenders. The Focus ST’s profile is disappointingly standard. It even has the same side skirts and side mirrors, so there’s no aerodynamic optimization here. But it sits marginally closer to the ground (around 0.4 inches) and features new-design wheels. The new five-twin-spoke rims measure 18 inches standard and are available in two finishes, Dark Sparkle and Magnetite. You can also opt for a larger 19-inch design in Magnetite. Thankfully, the Focus ST become more aggressive around back, mainly due to a larger spoiler atop the tailgate. The revised diffuser is also worth mentioning, as it features revised black trim and big, round exhaust pipes instead of the Focus’ dull trapezoidal outlets. Of course, a red "ST" badge was placed on the fascia to signal the hatchback’s hotter trim level. The car you’re looking at is finished in Ford Performance Blue, an exclusive hue created for the Focus ST. The same goes for Orange Fury, offered alongside familiar colors like Frozen White, Magnetic grey, Race Red, Ruby Red, and Shadow Black. Some of them are shared with the Ford Mustang. Step inside the ST and you’ll find the same layout as in the regular Focus. The organic-looking, multi-layered dashboard, the trapezoidal center stack with minimal controls, and the infotainment display placed atop the dash bring the hatchback into the modern era. The instrument cluster isn’t particularly impressive, but the bespoke screen between the dials displays turbo boost pressure, oil pressure, and oil temperature just like in the GT supercar. The flat-bottom steering wheel and the heavily bolstered seats are strong hints that the ST is no regular Focus. The Recaro front seats were specifically tuned by Ford Performance to offer the best position and optimum lateral support. My main complaint here is that the seats are finished in Ebony, an almost black hue. This is typical to sporty vehicles in today market, but it’s become boring really. We need more lively interiors and we need them as standard equipment. 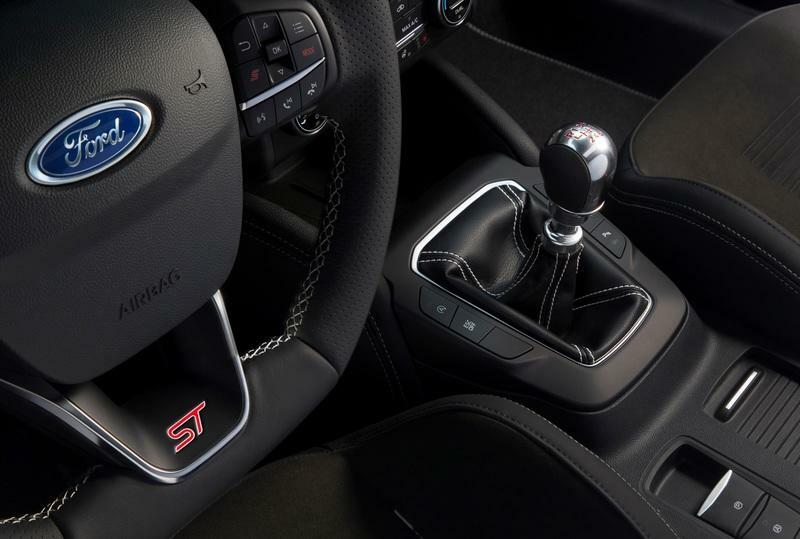 Other features that set the ST apart include aluminum gear knob and scuff plates, alloy pedals, satin silver trim, and grey stitching on the seats, door inserts, and center console. Needless to say, while the dashboard is still made of plastic, the Focus RS look pretty upscale. It’s not as fancy as the Golf GTI, but the more modern design helps a lot and puts the dated GTI in an uncomfortable position. Tech-wise, the Focus ST comes with a solid package that includes Ford’s latest SYNC3 infotainment system. It allows you to control audio, navigation and climate functions, but you can also connect your smartphone via Apple CarPlay and Android Auto. 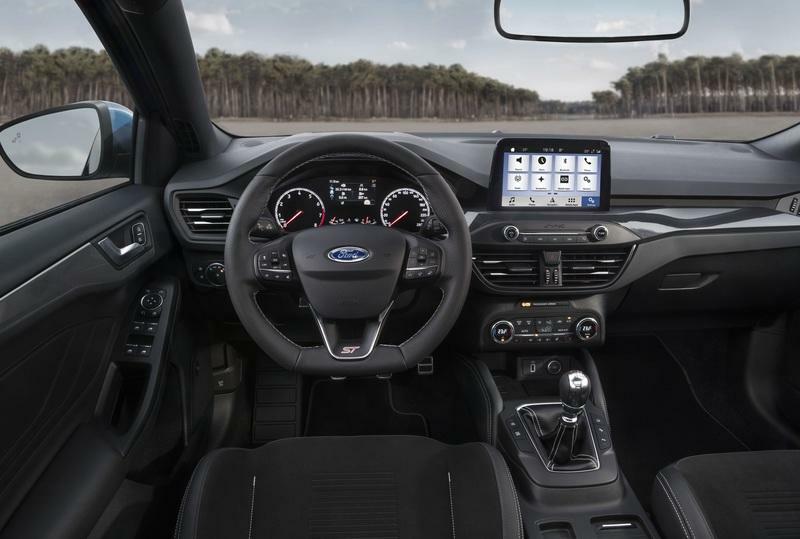 The eight-inch display will also give you access to simple voice commands and a FordPass Connect feature that turns the vehicle into a mobile WiFi hotspot with connectivity for up to 10 devices. This feature is optional though. The Focus ST also comes with the first head-up display offered in Europe, as well as adaptive cruise control with Stop & Go, Speed Sign Recognition, and Lane-Centring. The Adaptive Front Lighting System with camera-based predictive curve light and sign-based light adjusts headlamp patterns for improved visibility by monitoring bends and, for the first time in this segment, road signs. Evasive Steering Assist, also a segment-first technology, helps you steer around stopped or slower vehicles to help avoid collisions. Although the new Focus is a big bigger in every department, it still doesn’t match the headroom and should room offered by the Golf GTI. The latter offers an extra 1.2 inches of headroom in the first-row seats and an additional two inches of shoulder room in the front and the back. I’m not saying it’s not comfortable, but if you’re looking for the most available space, the Golf is the slightly better option. The Focus ST wins when it comes to luggage space though. 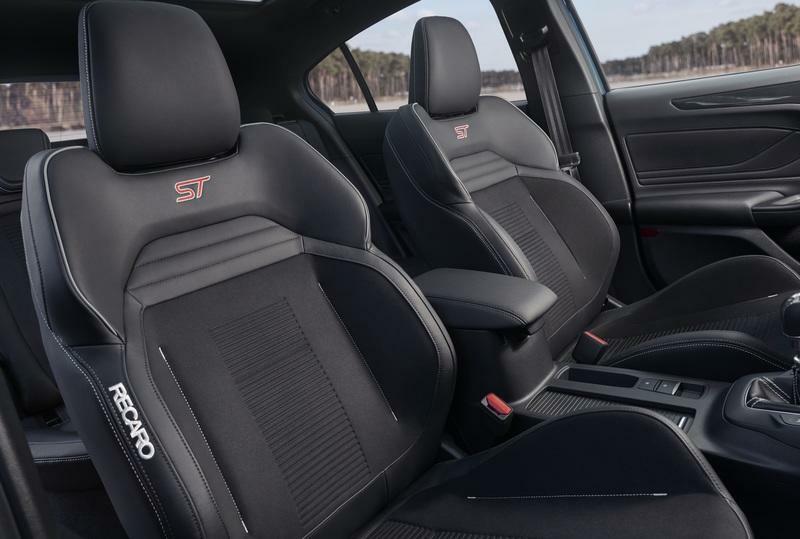 While the Golf GTI is spacious enough at 13.4 cubic feet, the new Focus ST offers an extra 2.2, being able to take up to 15.6 cubic feet of stuff behind the second-row seats. When these are folded flat, you can load up to 44.8 cubic feet in the Golf. But the Focus ST can do better than with a total capacity of 46.6 cubic feet. That’s an extra 1.8 cubic feet. While the regular Focus is now available with three-cylinder engines only, the Focus ST continues to feature a four-banger. However, rumors that Ford might drop the 2.0-liter EcoBoost in favor for the 2.3-liter unit turned out to be true, and the hatchback is now powered by a mill related to that in the Mustang. This is actually a new-generation mill, so it features a number of upgrades compared to familiar EcoBoost from the Mustang. It includes a low-inertia, twin-scroll turbocharged for enhanced engine response and an electronic, actuated waste-gate for optimized performance at all engine speeds. It also incorporates the innovative anti-lag technology that Ford offered in the GT supercar and F-150 Raptor truck only up until now. This technology keeps the throttle open when you lift off the accelerator pedal, enabling the reversal of air flow from the turbocharger to maintain wheel speed and boost pressure to build faster on demand. This means you also benefit from immediate power delivery in Sport and Track driving mode. But is the new EcoBoost engine more powerful than the old unit? Rated at 276 horsepower, it delivers an extra 24 horses compared to the outgoing ST. Torque is also up to 310 pound-feet, a 40-pound-foot increase over the previous generation. The 2.3-liter EcoBoost isn’t as powerful as the one in the Mustang though, which generates 310 horsepower and 350 pound-feet of torque. But while it’s not as powerful as the Mustang, it raises above the competition, which is exactly what matters here. The Volkswagen Golf GTI is no match for the new Focus ST, even when fitted with the optional Performance Pack that increases output to 247 horsepower and 270 pound-feet of torque. 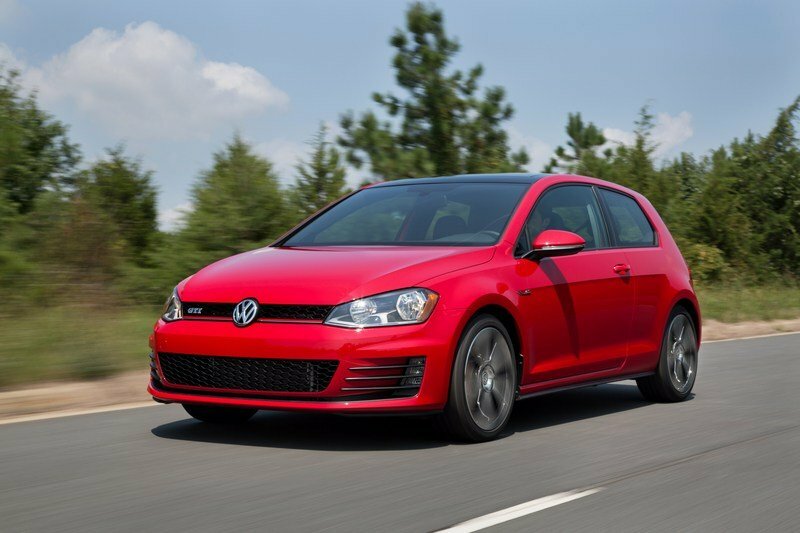 In this trim, the Golf GTI suffers from a healthy 29-horsepower and 40 pound-foot deficit. The same goes for the Hyundai i30 N, which comes with 246 horsepower and 260 pound-feet of torque on tap. However, the model fitted with the Performance Package delivers 271 horsepower, which means the Focus ST boasts only five extra horses. However, Ford’s hatchback boasts a solid 50-pound-foot advantage over its Korean rival. On top of having the most powerful engine in its niche, the Focus ST also features Ford’s first electronic limited-slip differential developed specifically for a front-wheel drive car. It enhances stability and cornering by providing sharper responses to driver inputs. The system features hydraulically activated clutches that limit engine torque delivered to a wheel that has reduced traction and redistributes power to the wheel with more traction. The Selectable Drive Modes technology also makes its debut in the Focus ST, enabling you to adjust eLSD, CCD, EPAS, throttle mapping, automatic transmission shift scheduling, electronic stability control, electronic sound enhancement settings. Standard modes include Slippery/Wet, Normal, and Sport, while the Performance Pack options adds a Track mode. The Sport mode is available through a dedicated button on the steering wheel, while an additional Mode button allows you to quickly scroll through the drive settings. Track mode provides a more aggressive setup with maximum traction from the eLSD system. Transmission choices include an old-school six-speed manual or a quicker shifting seven-speed automatic. Performance-wise, Ford says the Focus ST will hit 62 mph from a standing start in less than six seconds. 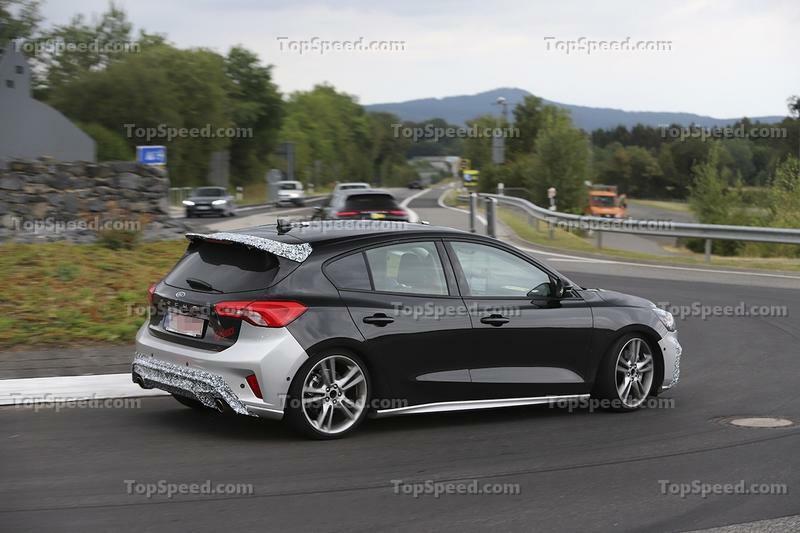 This isn’t exactly revealing, but it tells us that the Focus ST will be at least a half-second quicker than the Volkswagen Golf GTI and Hyundai i30 N. It will also be quicker than the i30 N with the Performance Package, which needs 6.1 seconds to hit the benchmark. Until the next-gen Golf GTI arrives, the Focus ST will be the quickest in its segment. 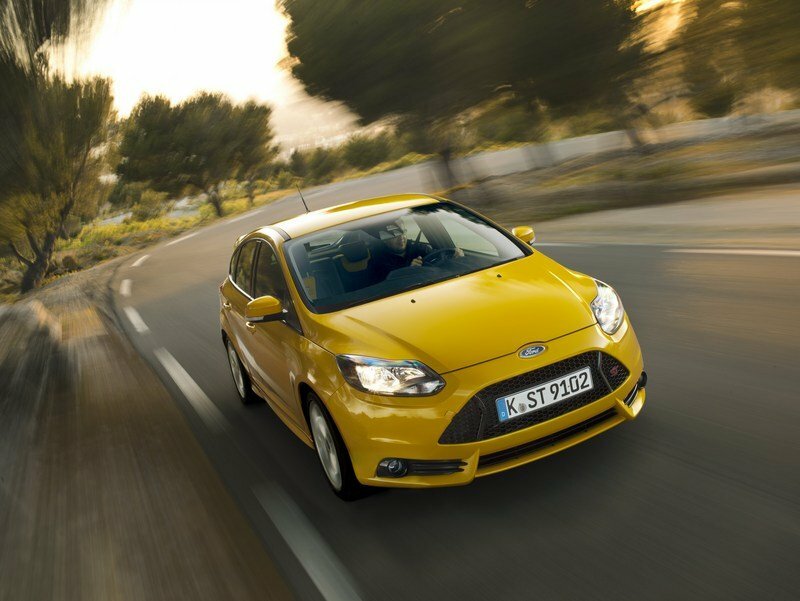 The new Focus ST is available with a diesel engine as well. This isn’t the first ST with an oil burner. Ford offered a similar version for the previous generation as well, but the old 2.0-liter Duratorq unit was dropped for the new 2.0-liter EcoBlue mill. Interestingly enough though, the new four-cylinder is only marginally more powerful and delivers identical torque. Specifically, the EcoBlue engine cranks out 187 horsepower and 295 pound-feet of torque, while the old Duratorq powerplant generates 182 horses and 295 pound-feet of twist. So you’re only getting five extra horsepower. 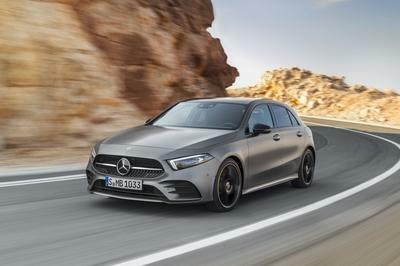 This is enough to compete with the existing Volkswagen Golf GTD though, Powered by a 2.0-liter four-banger, the German hatchback comes with 181 horsepower and 280 pound-feet of tap. That’s an extra six horsepower and 15 pound-feet for the Focus ST. However, this new engine comes with better technology and internals that return better performance and enhanced fuel economy. It has a low-inertia, variable geometry turbocharger, steel pistons, and integrated intake system with innovative mirror-image porting. It also includes Torque Vectoring Control technology, which improves stability at all speeds and reduces understeer by applying brake force to the inside front wheel when cornering. So while it’s not very powerful compared to the old model, the new Focus ST should be quicker and more nimble. Ford has yet to release 0-to-62 sprint figures, but it should be quicker than the previous hatchback. 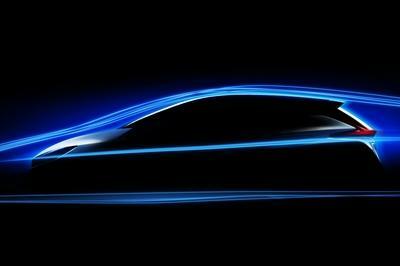 The outgoing model needs 8.1 seconds to hit 62 mph, so it’s safe to assume that the new EcoBlue engine will push the five-door to the same speed in less than eight clicks. For reference, the Golf GTD gets there in 7.5 seconds. The Focus ST rides on Ford’s new C2 architecture, which replaced Global C platform that Ford introduced back in 2011. 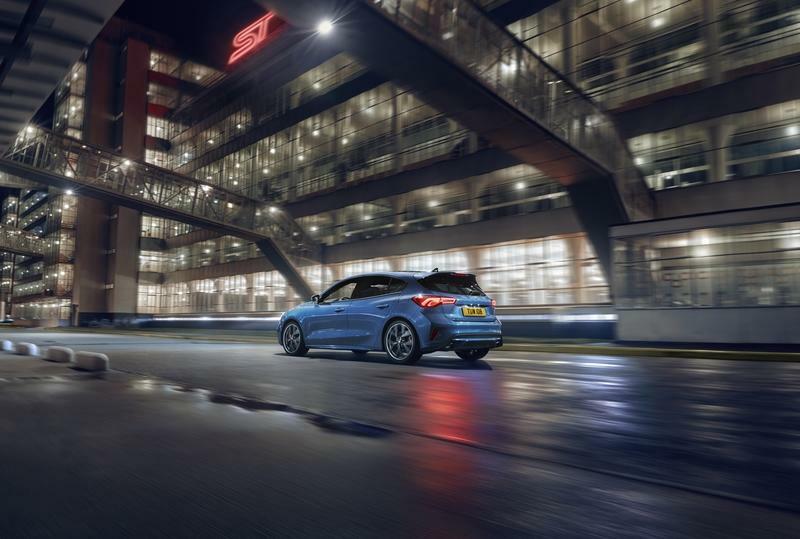 These new underpinnings are lighter and made the regular Focus far more responsive and agile, to the point that it’s almost as sporty as the old ST. 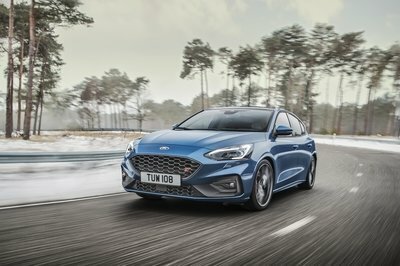 Naturally, the unique suspension setup of the new Focus ST takes things even further, making this hatchback the most agile version yet, at least until a new RS version comes out. 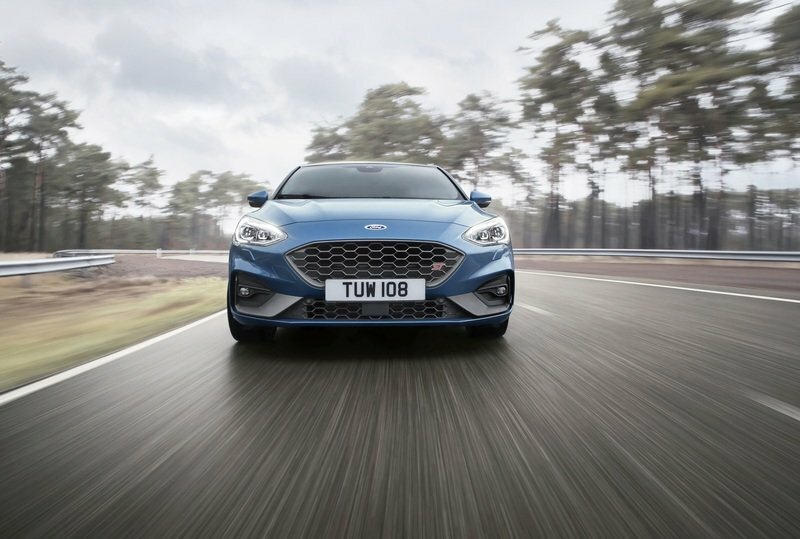 The ST suspension features a unique geometry with repositioned dampers and damping stiffness increased up to 20 percent in the front and 13 percent in the rear. The Continuously Controlled Damping technology monitors suspension, body, steering, and braking inputs every two milliseconds and adjusts damping accordingly. The power-assisted steering system from the Fiesta ST was redesigned for the Focus ST, making the latter the fastest-steering Ford yet. Around 15 percent faster than the standard Focus, it requires just two turns lock-to-lock, which is very similar to race cars. As is usual on ST-badged Fords, the brake rotors are larger than on the standard model. Front discs measure 13 inches, while those in the rear have an 11.9-inch diameter. 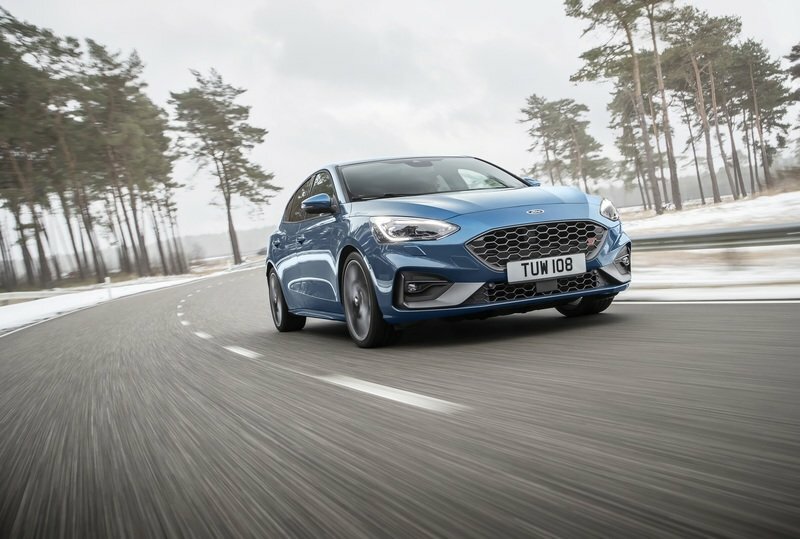 Ford says these new brakes were tested using the same procedures as the GT supercar and the results were impressive, as the ST achieved almost four-time the fade resistance of the previous-generation hatchback. 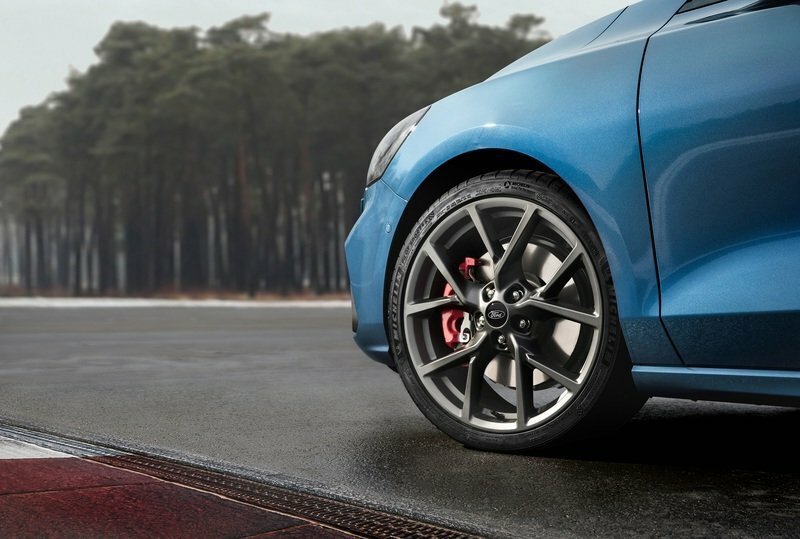 Not only more wear-resistant, these brakes provide enhanced stopping compared to the regular Focus, which comes in handy during spirited driving or even on the race track. The Focus ST is also equipped with an Electronic Brake Booster function that builds brake pressure faster than a hydraulic system for a more confident and consistent pedal feel. It also adjusts the braking feel and dynamics to match the selected driving mode, so you probably get an even stiffer pedal in Sport and Track modes. Pricing for the new Focus ST is not yet available, but it will definitely increase compared to the outgoing model. 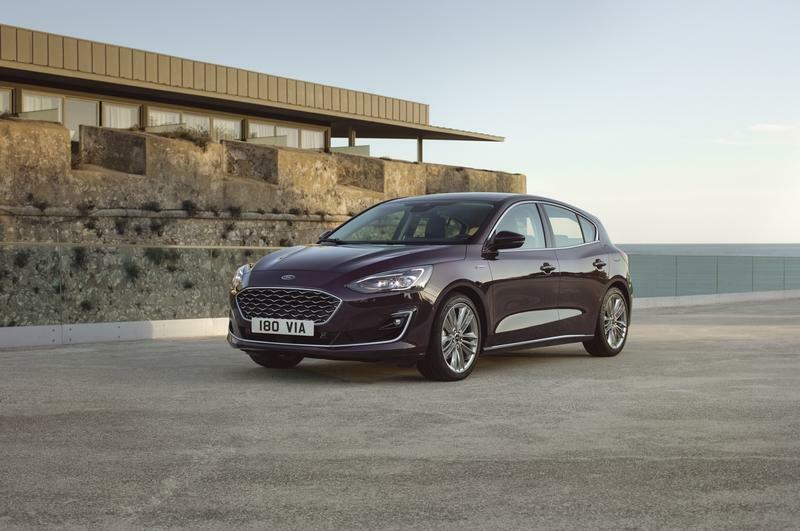 Expect it to cost more than the range-topping Focus Vignale, which comes in at £25,800. It probably won’t be as expensive as the Volkswagen Golf GTI Performance, which retails from £31,620, but it will fetch around £30,000 before options. Arguably the more important thing to know is that the Focus ST will no longer be offered in the U.S. With the Focus discontinued on this side of the pond, the performance-oriented ST won’t make it here either. Arguably the most iconic and popular hot-hatch since the 1980s, the Golf GTI continues to rule to performance-oriented segment thanks to its sporty looks, powerful engine, and affordable price. Redesigned for the 2013 model year and updated in 2016, the seventh-generation GTI draws juice from a turbocharged, 2.0-liter, inline-four that delivers 230 horsepower and 270 pound-feet of torque. The optional Performance Pack increases output to 247 horsepower. The German hatch needs 6.4 seconds to sprint from 0 to 60 mph and tops out at 155 mph. Although it isn’t quicker than the competition, the GTI greets its owners with a nice interior and good fit and finish. Pricing for the GTI starts from £31,620. Unlike the Focus STI, the Golf GTI is available in the United States. Read our full review of the 2018 Volkswagen Golf GTI. The i30 N is the newest model in this class and the first serious competitor for the Focus ST and Golf GTI in many years. 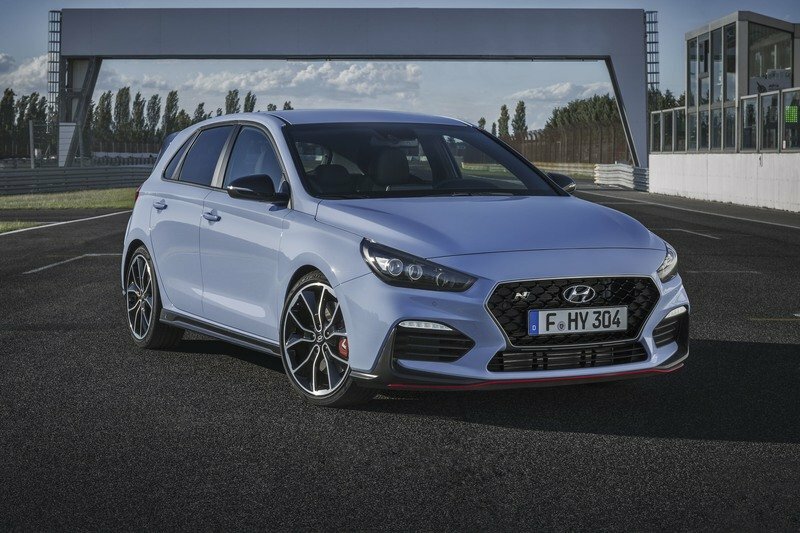 Developed by Hyundai’s still-young N performance division, the i30 N boasts a significantly more aggressive exterior, sporty seats, and a lap timer. Motivation is provided by a 2.0-liter T-GDI engine offered in two configurations. The Standard Package comes with 246 horsepower and 260 pound-feet, while the Performance Package cranks out 271 horses. An overboost function adds eight percent more torque and quicker acceleration. 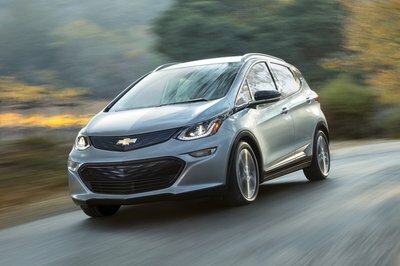 Speaking of which, the Standard model hits 62 mph in 6.4 seconds, while the Performance version gets there in 6.1 clicks. Top speed is rated at 155 mph. The i30 N is a bit more affordable than the competition, coming in at £25,995. Opt for the Performance Package, and the sticker jumps to £29,495. Read our full story on the 2018 Hyundai i30 N.
Although not as iconic s the Golf GTI, the outgoing Focus ST made a great impression thanks to its sporty design and powerful drivetrain. And while the old hatchback may look a bit dated inside and out, its drivetrain still has what it takes to give the Volkswagen a run for its money. With updated styling, a more modern interior, and even more powerful EcoBoost engine, the new Focus ST might just rule the segment until the Germans roll out a new Golf GTI. 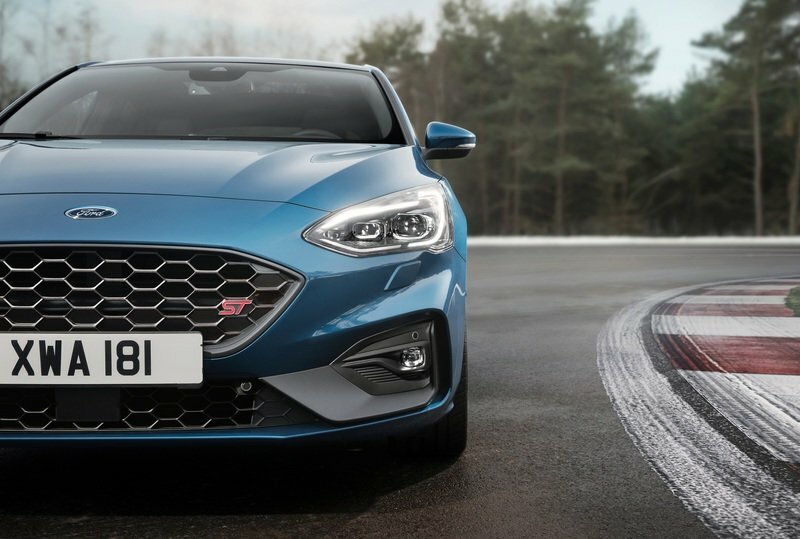 The good news is that Ford added plenty of power to counter the Hyundai i30 N’s Performance Package and it won’t cost a lot more. The bad news is that the Focus ST isn’t coming to the U.S., so it will leave this market to the Golf GTI. 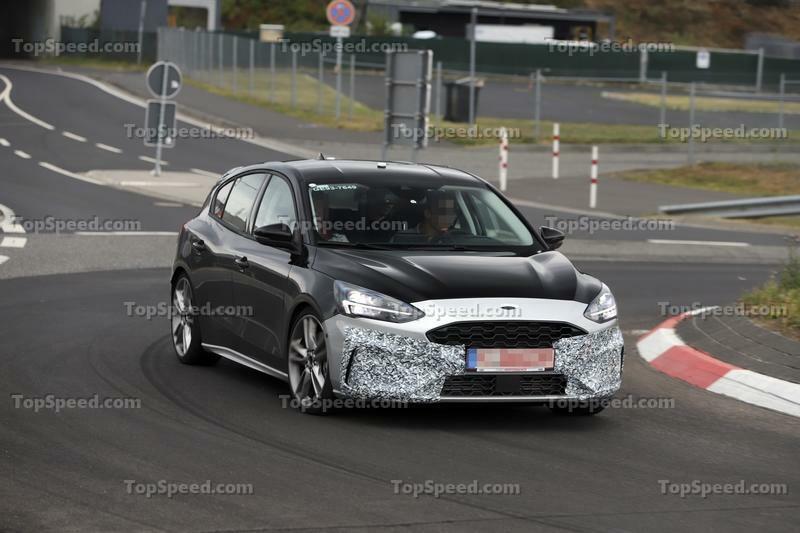 It was only a matter of time before we started seeing the Focus ST prototype in the metal and our photographers finally caught it lurking on the Nurburgring doing what hot hatches do. Naturally, there won’t be a lot of change compared to the standard next-gen model, however, it will feature a large roof spoiler, lower suspension, and a healthy dose of power that is dialed into somewhere between 250 and 275 horsepower. As far as we know, that power will be derived from a 2.0-liter four-banger, but there are rumors floating around that a 1.5-liter mill could also be found. It’s nowhere near as likely, and that power output would put it at the top of its reliable range, but it would offer up some benefits at the cost of aftermarket tuneability. 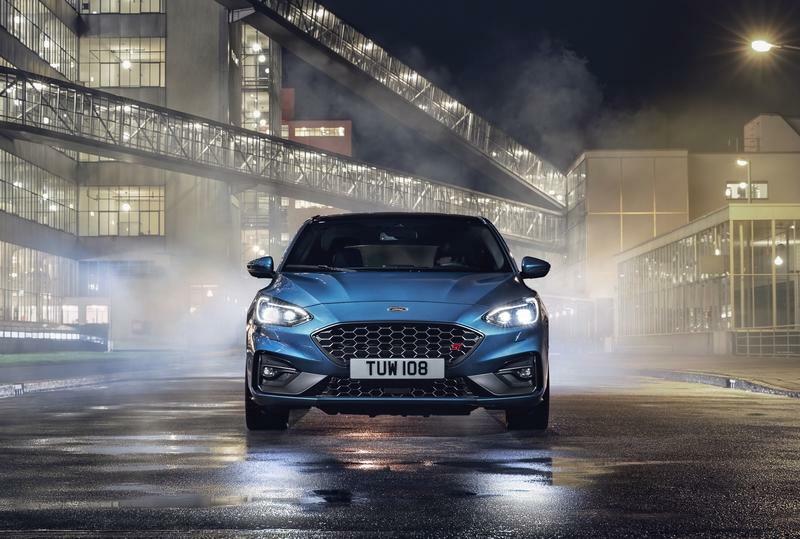 Ford today revealed the all-new Focus ST – developed by Ford Performance to deliver nimble hot-hatchback thrills in a stylish, comfortable and practical family car.